Inhale hints of honeysuckle and springtime in our rare Australian Rose Essential Oil which is distilled and harvested in the balmy Byron Bay hinterlands. This captivating confidence booster evokes an essence which is buoyantly bright. Purchase this product now and earn 62 Points! The exceptionally rare Australian Rose grows on a tree that can reach up to 30-feet tall. 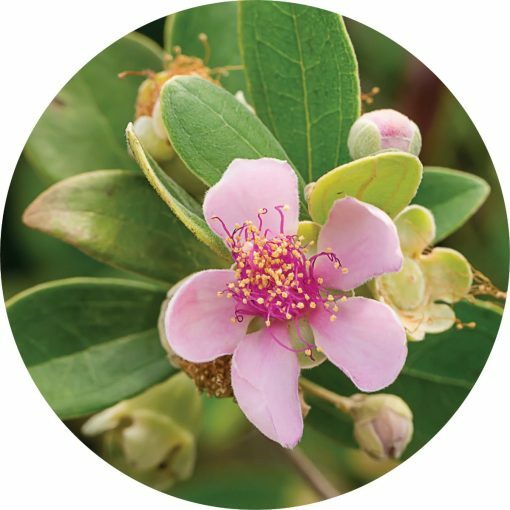 This unique essential oil distillation from the Myrtaceae family is brimming with gorgeous geraniol andgeranyl acetate which are botanical constituents that is sublime for skincare. The constituent geraniol is a monoterpene-alcohol, Dr. Kurt Schnaubelt writes that this component acts like a tonic, are well tolerated and “have some of the most appealing fragrances. The oils in which these alcohols are dominant may be used liberally and frequently and therefore have great value maintaining balance” and general verve (1999: 179). Sparkles of citrus, floral wafts, with a woodsy rhapsody. Sandalwood, Cypress, Sweet Thyme, Blood Orange, Geranium, Nerolina, Rosalina, Lemon Myrtle, Lavender, Black Spruce, White Fir, Silver Fir, Douglas Fir, Frankincense, Ylang, Rose, Neroli, and Bergamot. Perfect in perfumes as a single note essence or combined with other oils for a complex scent. Diffuse with ylang and bergamot to fill a room with relaxing revelry. Bath in its beauty with a drop of its calming dew. Replenishing in blends and massage oils. Simply lovely in skin serums.